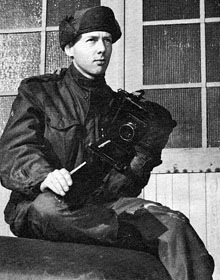 Based in Kaiserslautern, Germany between Korean and Vietnamese Wars, I served as a still photographer for the U.S. Army Signal Corps 1956-1957. With an ear for the local idiom (having studied German for two years), I was sometimes mistaken for a native speaker and, off-duty, did my best to look like one. With 30 days of leave a year, I traveled around France, Italy, Holland, and much of the wine-growing region west of the Rhine River. On foot, I roamed the hills around Kaiserslautern whenever I could, while most of my Army buddies played cards, went to the PX, or movies on base. Putting my conscious mind where my body was, I think I got more from my military experience than those of my buddies who carried on as if they were still in the States. I bring this up because I see so many people hiking the trails of Acadia National Park jabbering away as if they were back wherever they came from. That is, their minds are anywhere but where their bodies are at the moment. Which is why I published ACADIA: The Soul of a National Park in 1998—to show some of what might be discovered by actively exploring the trails along the way instead of manfully striding to the top of the mountain and then back to the car. The point being that we have to actively reach out to the landscape if even a portion of it is to register in consciousness. Looking is the greater part of seeing; without it we are functionally blind. If you don’t have a mind for rare plants, you’ll never have an eye for them, either. Thoreau’s next sentence: “A man sees only what concerns him.” (Page 351.) Expectancy is destiny. True for us all. We generally see only what we have an interest in seeing in the world around us. To see more, we have to develop an interest in seeing more. We have to be trained—or train ourselves—to see what we’re missing. Thoreau got that right. It takes “a different intention of the eye” so see anything we are not accustomed to look for in our surroundings. Intention is the key word in using our eyes. And ears, and fingers. The nose is different. With molecules actually settling on our olfactory membranes, we smell them whether we want to or not. Where smells have their own characteristic insistence, sights and sounds are more matters of intention on our part. Which is why we generally see what we are familiar with, as long as it’s not upstaged by a more commanding presence. Parents in the audience single out their children in the chorus and have eyes only for them, even though others may be better performers. Attention is in the eye of the beholder. Which raises the question, if we want to learn to see or hear more than we do now, how do we upgrade our intention? That, of course, is one thing schools are for. If you missed what you wanted to learn then, there are always guide books to trees, butterflies, seashells, birds, music, wines, and just about everything else you want to gaze on, taste, or listen to. Or you can get an advanced degree in intentionality in any number of disciplines such as astrophysics or restaurant management. Of course there’s always the library, bookstore, Internet, museum and any number of institutions to help you live out your desire to see more along the road of life itself. What these aids can’t do for you, however, is the work of applying their message to your particular situation. You’ve got to put in the necessary ten-thousand hours on your own (see Reflection 75: Ten-Thousand Hours). I got my first camera when I was four years old for a box top and a quarter. I put in ten-thousand hours taking pictures of my brothers, dogs, friends. I became a photographer in the Army, and a photographer’s assistant on the New York scene when I got out. I worked as a photographer at Iowa State University, Harvard College Observatory—and am still at it. I have fulfilled my visual intentions many times over. Then I got into teaching photography at Phillips Academy in Andover, and had to put in another ten-thousand hours learning to be a teacher. Which I really pulled off by teaching learning-disabled students at Landmark School in Beverly, MA. By then I knew classes were a myth of convenience; each student was an individual learner on his or her own. I could spot left-handers and hook-writers and cheek-resters across the room. For any given assignment, I found ways each student could learn from it what she or he needed to learn. I felt pretty good about putting my teaching intentions into practice. Then, thinking I knew how to do it, I turned to writing—and had to start all over with yet another stint of ten-thousand hours devoted to learning how to write by writing the same thing over and over again. And so it goes. When teacher says, “Listen up, class,” she means for every student to hear her words exactly as she intends them, with no exceptions. But that’s wishful thinking. We are who we are, no two alike. We listen according to our training, experience, motivation, and ability—and are sure to hear a different message than teacher intends. The same goes for looking at pictures, movies, videos, Websites, graffiti, or masterpieces of art. The apprenticeship never ends; there’s always more to see than our eyes can relay to our minds. Seeing is a matter of exploring the possibilities by expanding our visual intentions ad infinitum. Living in cities as most of us do, what can we see in nature? Sometimes, very little. The story is told of a family from Philadelphia coming to Mount Desert Island for a two-week vacation—and leaving after two days because there was nothing to see. The great outdoors was wholly beyond them. As Thoreau said, “The greater part of the phenomena of Nature are . . . concealed from us all our lives”—and he was talking about rural Concord Massachusetts in the mid-nineteenth century. If we are out of touch with nature today, we are in B-I-G T-R-O-U-B-L-E because nature is what provides our toehold in the universe. My own studies show that sea level is rising on the coast of Maine even as I write these words. Looking blindly from the picture windows so dear to our hearts, we do not sense the dangers lurking off the end of the dock. We don’t feel the crosshairs lined up on our chests, the laser beams steady on our brows—because our intention is to ignore them. La, what is the North Atlantic to me, or am I to the North Atlantic? That double-ended query tells the whole story. Out of touch with nature, we are out of touch with life itself. As I said, expectancy is destiny.